ATLANTA - Aug. 22, 2018 - PRLog -- Attorneys are known to be advocates for other people. Good attorneys are known for performing miracles inside of the courtroom. Great attorneys are known for helping others AND making positive impact inside and outside of the courtroom. Atlanta's Shequel Ross, popularly known as SHElaw is making waves around the world and on the internet. As the founder of the Legal Education Movement™, she set out in 2016 to bring legal information to the masses. Since she joined social media, her situational memes, posts and skit videos have garnered hundreds of thousands of views, comments, shares and likes. In July, a Twitter fan, named Don shared one of her legal skits and touched an audience that wasn't yet aware of her booming platform. 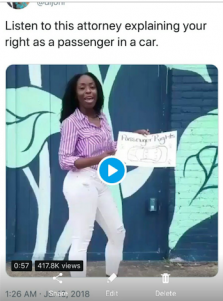 The video featured Attorney Ross holding a diagram of a car, outlining the different rights that passengers have when riding in a car that has been pulled over. In a day and age with people being wrongfully victimized during traffic stops, this information has been met with love and major support from other attorneys, police officers and grateful civilians. At the time of this press release, the video has reached nearly a half million views and has led to an abundance of calls, e-mails and requests for Attorney Ross to speak at colleges and large forums. A graduate of Western Michigan University's Cooley Law School, Shequel Ross is the principal and founder at The Law Offices of Shequel Ross, LLC. She is the visionary behind the #GetOutOfJail movement—freeing wrongly imprisoned people and has rooted herself in the media as a no-nonsense advocate for the underdog.